You may be thinking you are having all the fun in facebook while scrolling down the news feed which is populated by the photos and content from friends, friends of friends, groups and pages.Sometime yo even get tired of the seeing photos all over again and the ads make you sick. I have a tip which i will share with you to enjoy facebook to the maximum. Facebook the leading social media with up to 2 billion active users have a feature or separate section where the best and most interesting contents can be accessed. The section which is populated by the most engaging stuffs on facebook is available in the application and the web app. The feature is too interesting that it sometimes crashes and takes you in a flip back to your native news feed. 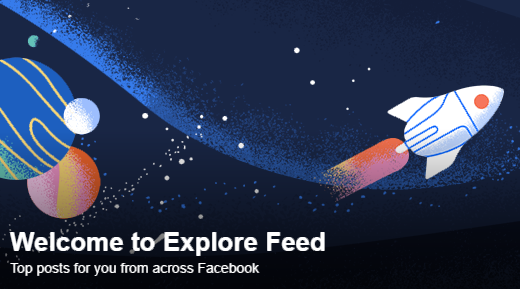 The feature is called, Facebook “Explore Feed”. Explore Feed never gets boring you will end up staying longer on facebook sfter you have discovered this feature. Tap on the menu icon which is designated by three blue bars usually on the right. Scroll down a bit and you will get to see the Explore Feed. The videos will Autoplay if you have not done this. For web users, check the bottom of the left sidebar. How does contents come up on Explore feed? Facebook has not made this known but you can decipher that all the stuffs on Explore Feed have a high engagement rate. So if you are a content creator on facebook and will like to have you stuff show up on facebook Explore Feed, you will have to make sure that your content is well engaging.